Glenn Close Celebrates 'Mother of the Maid' Opening with Her Pup Pip! Glenn Close strikes a pose with her adorable pet pooch Pip while attending the opening night party for her play Mother of the Maid held at the Public Theater on Wednesday (October 17) in New York City. The 71-year-old actress was joined at the event by her co-stars Grace van Patten, Olivia Gilliatt, Kate Jennings Grant, Andrew Hovelson, Daniel Pearce, and Emmy-winning playwright Jane Anderson. Also in attendance to show their support was Grace‘s boyfriend Nat Wolff, Rose Byrne, Michael Stuhlbarg and Rachel Dratch. Mother of the Maid tells the story of Joan of Arc’s mother (Glenn), a sensible, hard-working, God-fearing peasant woman whose faith is upended as she deals with the baffling journey of her odd and extraordinary daughter. This riveting play is an epic tale told through an unexpected and remarkable new perspective – Buy tickets here! 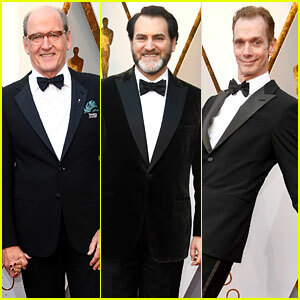 Richard Jenkins suited up for the 2018 Academy Awards! The 70-year-old actor hit the red carpet at the event held at the Dolby Theatre on Sunday (March 4) in Hollywood. He paired his tux with a blue handkerchief and a Time’s Up pin, and was joined by his wife Sharon R. Friedrick. Richard was also joined by his The Shape of Water co-stars Michael Stuhlbarg and Doug Jones, as well as Doug‘s wife Laurie. Richard is up for Best Supporting Actor for his role as Giles in the film, and The Shape of Water is nominated for lots of other categories as well. Make sure to watch the Oscars, hosted by Jimmy Kimmel, at 8pm EST/5pm PST on ABC. FYI: Richard is wearing a Giorgio Armani tux and an IWC watch. Doug is wearing Armani. Michael is wearing a Brioni tux and Loriblu shoes. 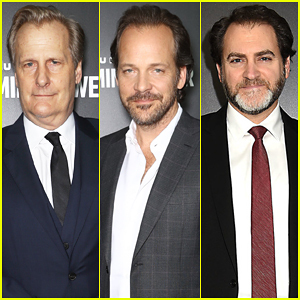 Jeff Daniels, Peter Sarsgaard & Michael Stuhlbarg Step Out for 'The Looming Tower' Series Premiere - Watch Trailer! Jeff Daniels, Peter Sarsgaard and Michael Stuhlbarg suit up to hit the red carpet at the premiere of their new Hulu series The Looming Tower held at Paris Theatre on Thursday (February 15) in New York City. The leading stars were joined at the event by their cast mates Ella Rae Peck, Sullivan Jones, Tahar Rahim, Jamie Neumann, Wrenn Schmidt, Virginia Kull and Ayman Samman. The Looming Tower is a new limited series that traces the rising threat of Osama Bin Laden and how the rivalry between the FBI and CIA may have inadvertently set a path for the tragedy of 9/11. The series premieres February 28, only on Hulu – Watch the trailer below! 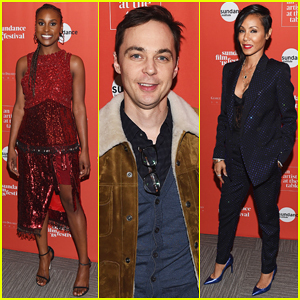 Issa Rae, Jim Parsons, Jada Pinkett Smith & More Help Kick Off Sundance Film Festival 2018! Issa Rae and Jada Pinkett Smith strike a pose on the carpet while attending An Artist at the Table Cocktail Reception & Dinner held during the 2018 Sundance Film Festival at DeJoria Center on Thursday (January 18) in Park City, Utah. The 33-year-old Insecure star and Jada, 46, were joined at the kick off event by Jim Parsons and his husband Todd Spiewak, Chloe Sevigny, Octavia Spencer, Chaz Ebert, Michael Stuhlbarg and Maggie Gyllenhaal. Jada, Octavia and Michael are among the jury members for the 2018 Sundance Film Festival. That same day, Issa joined Jason Mantzoukas, Zoe Kazan and Nick Offerman on Delta Air Lines’ fourth annual Delta Festival Shuttle to Park City flying from Los Angeles. It is a total party in the sky, as this influential crowd buzzed about the aircraft networking, sipped cocktails from the open bar, chatted about their Sundance projects and some even won tickets to far flung Delta destinations. Also pictured: President and Founder of Sundance Institute Robert Redford joining Executive director of Sundance Institute Keri Putnam and Sundance Film Festival director John Cooper onstage during the 2018 Sundance Day One Press Conference at Egyptian Theatre. FYI: Issa is wearing an Altuzarra dress and Jennifer Fisher hoops. 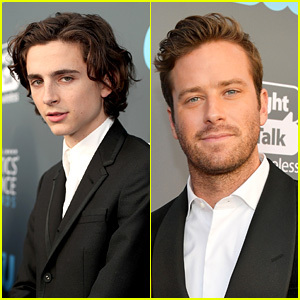 Timothee Chalamet & Armie Hammer Look Dapper at Critics’ Choice Awards 2018! Timothee Chalamet and Armie Hammer are looking sharp as ever at tonight’s 2018 Critics’ Choice Awards! The 22-year-old and 31-year-old Call Me By Your Name co-stars hit the red carpet at the awards show on Thursday (January 11) held at The Barker Hangar in Santa Monica, Calif.
Co-star Michael Stuhlbarg also hit the red carpet. He’s also nominated for Best Supporting Actor. Armie was accompanied on the red carpet by his wife, Elizabeth Chambers. Timothee is nominated for Best Actor, and Armie is nominated for Best Supporting Actor during the night’s ceremony. Call Me by Your Name has a total of eight nominations! FYI: Armie is wearing a Ralph Lauren Purple Label tuxedo, Christian Louboutin shoes, and a Montblanc timepiece and cuff links. Elizabeth is wearing a John Paul Ataker dress, Christian Louboutin shoes, a Jimmy Choo clutch, Tacori earrings, and an H. Stern ring.